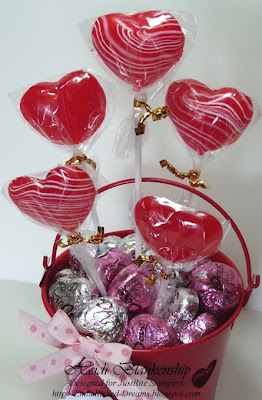 The JustRite Friday Challenge for this week is JRC_003, show us your Valentine Love! Every Friday the weekly challenge is announced on the JustRite Blog, but there is also a Challenge area on the JustRite Blog where all of the challenges are posted a month in advance. Click HERE for all of the Rules and Details. 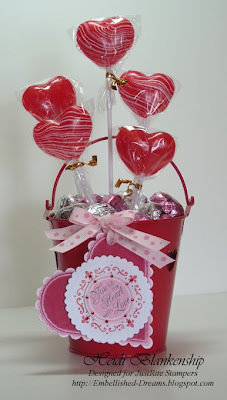 For this week's challenge Valentine Love I create a sweet little treat bucket with a very pretty Valentine tag. 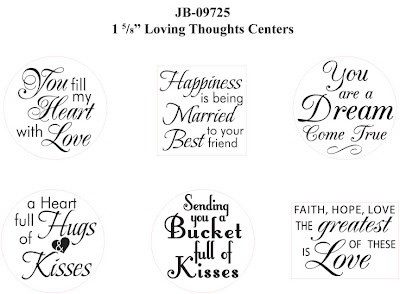 I used the Loving Thoughts Centers and the Decorative 2" Round Wide Borders along with the 2'' Round Stamper. 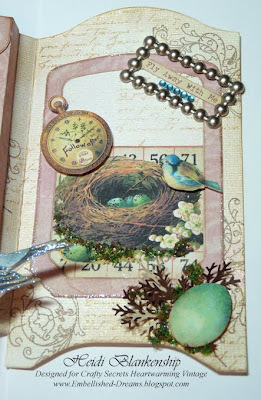 Here is a close up of the stamped images I used. 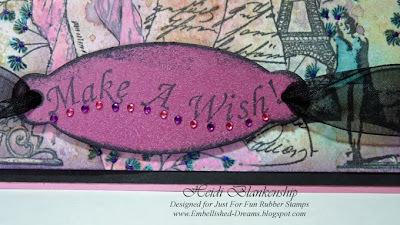 I started by inking the stamp with black ink and stamping it onto Bashful (pink) Post-it Craft Paper from 3M and then I made a circle diecut of the center using the Wizard™ and Standard Circles Large S4-114 die template from Spellbinders™ and then lightly sanded the edges to reveal the white core. 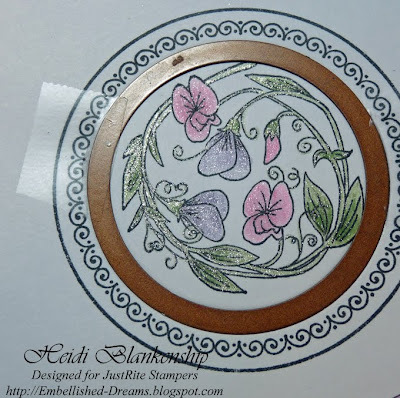 Next I used red ink and stamped the border unto white cardstock and made a diecut using the Wizard™ and Petite Classic Scalloped Circles Large S4-115 die template from Spellbinders™. 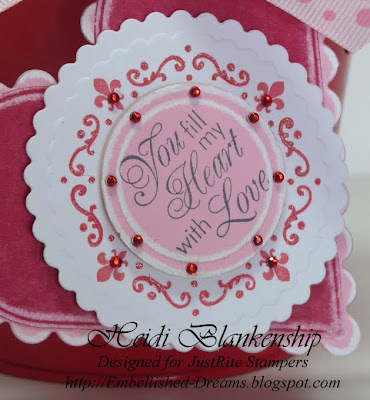 I wanted to have a heart shaped tag so I made two more diecuts using the Wizard™ and the Classic Heart S4-136, Classic Scalloped Heart S4-137 die templates from Spellbinders™. 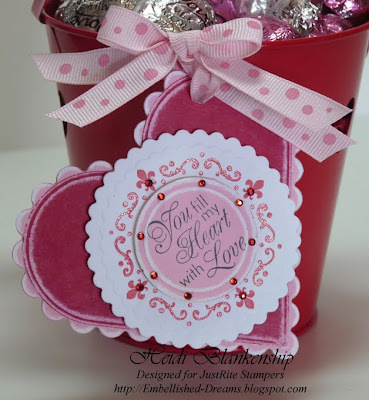 For the two hearts I used Bashful (pink/scalloped heart) and Crimson (red/classic heart) Post-it Craft Paper from 3M. I also sanded the edges to reveal the with core. I wanted to add a little sparkle and bling to the tag so I used a Gelly Roll Pen Red Star XPGB#719 from Sakura to trace around the flourishes on the border and for the bling I used Tiny Twinkles (red rhinestones) from Taylored Expressions. To adhere the rhinestones I used Gem-Tac from Beacon Adhesives. I also used foam tape from 3M to layer the diecuts. To attach the heart shaped tag I used a pink polk-a-dot ribbon from Creative Impressions and to add the bow at the top I used a little Fabri-Tac from Beacon Adhesives. For the inside of the bucket I used a styrofoam ball and covered it with red tissue paper and placed it in the bottom of the bucket. Then I sniped the ends of the sucker sticks at an angle so they could easily be pushed down into the styrofoam ball and then I added the yummy chocolate candy on top. I hope you will join in the fun and play along with the JustRite Friday Challenges! Not only are the challenges fun but you also have a chance to win some wonderful prizes!! Thank you so much for stopping by and I hope you are having a Wonderful Weekend!! Hello! I am back home from CHA--what a fun and exciting week!! I am still pretty tired and trying to get in the groove of things. It's the end of the month and that means deadlines! 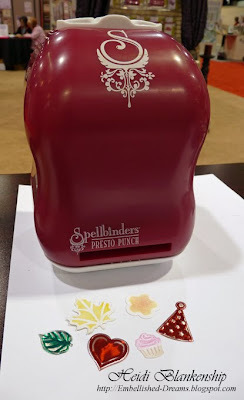 I have several projects I am working on so there in no art for this post but I do have some pictures to share with you of the Spellbinders booth at CHA and the NEW Presto Punch!! 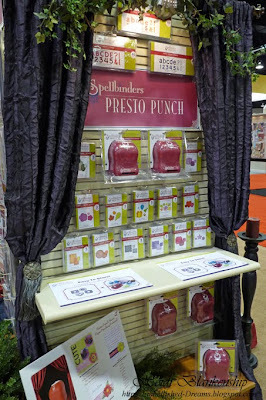 Here is the display in the Spellbinders booth for the Presto Punch~ Here is a close-up of the Presto Punch display~ Cathy Chlebana~Spellbinders Design Team Coordinator, Kim Hupke~Spellbinders Education Director and Me! ;-) This was at the demo table for the Presto Punch. Now let's take a close look at this sweet little baby! The Presto Punch is so easy to use and I know all of you ladies that might have issues with strength in your hands are going to love this little machine!! On the top you will see two buttons, push one down and hold until the machine stops and it is doing the punch for you and then hold the other button down until the booklet can slide out. How easy is that!?? The Presto Punch comes with 7 punch templates and two booklets, one for punching and the other for embossing. 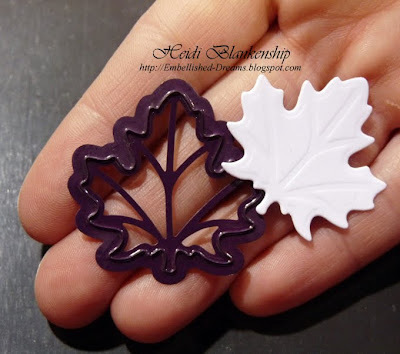 Here is a close-up of the leaf punch template and the punch after it has been embossed.~ And a few more punches. I LOVE the tiny cupcake--so sweet!! I had a wonderful time at CHA!! Always love meeting new friends and seeing old friends too! Stop back soon and I will have some creative art to share and more pictures. I hope you have a wonderful weekend!! Spellbinder at CHA!! NEW Presto Punch!!! Hello! Good things--Great and Fantastic things are going on at CHA!! 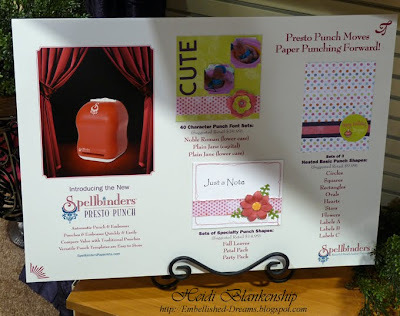 For those of you that are not attending CHA but are just dying to see some of the NEW Spellbinders™ Products being released you will want to check this out!! 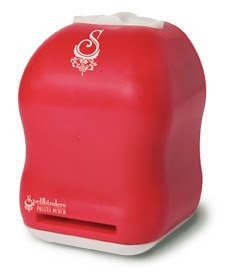 Click HERE for more information on the Presto Punch from Spellbinders™!!! Good Morning! Just so you know this is a scheduled post, by the time you see this I will be in California, (hopefully) sunny California for the CHA Show! If you are going to be coming to the SuperShow stop by the SCS Saturday afternoon, do a make-n-take and say hello! If you are coming to CHA please stop by the Spellbinders (4069) booth I would love to see you! Short and sweet for today! *wink* I promise while I am at CHA I will take as many pictures as I can and I will share them with you when I return. Thank you so much for stopping by today and I hope you have a wonderful weekend. Off to CHA and California!! Good morning! I am going to be heading out the door in just a little while. I am so excited about CHA! I love the excitement of the show with all of the new products, getting to see friends and making new ones! If you are going to be at the SuperShow or CHA please stop by and say hello! 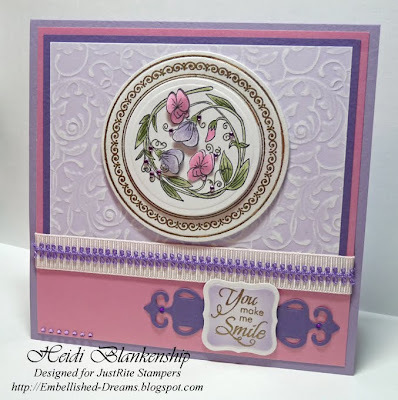 Saturday afternoon I will be at the SCS booth at the SuperShow with Kim Hupke, Education Director for Spellbinders™ and we will be doing make-n-takes. 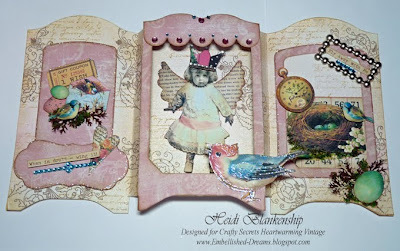 For the CHA show I will be working in the Spellbinders™ booth (4069) ----you will want to be stopping by to check it all out!! Some very exciting things will be happening!!! I have a couple of post scheduled for while I am gone--sorry it couldn't be more--but the clock is ticking--LOL! I will take lots of pictures and if I can get internet access maybe I will be able to hop on here and let you all know some of the exciting things happening at CHA. For those of you who are traveling to the show I wish you all safe travels!! Good Morning! 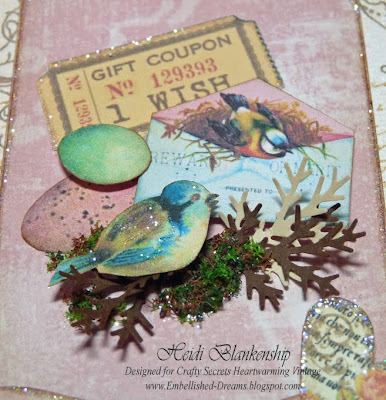 For today's card I used one of the New stamp sets from JustRite Stampers, Plant a Little Love. 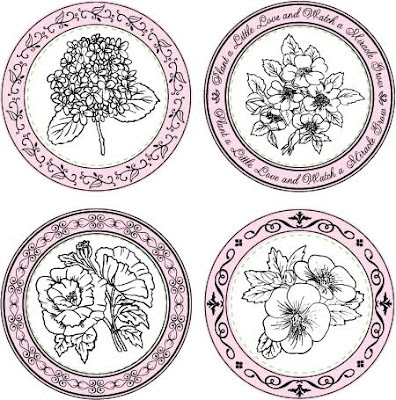 This set includes 4 Designer Centers with beautiful floral images--Poppy, Wild Prairie Rose, Hibiscus and Hydrangea and four Interchangeable Borders. 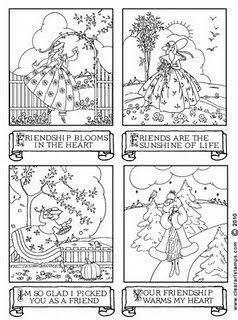 Three of the borders are decorative and one has a sentiment--Plant a Little Love and Watch a Miracle Grow. 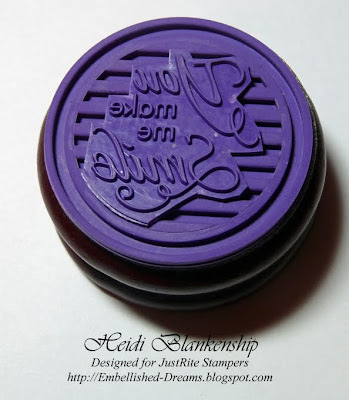 Also the stamp set fits the 3-1/4'' Round Stamper. 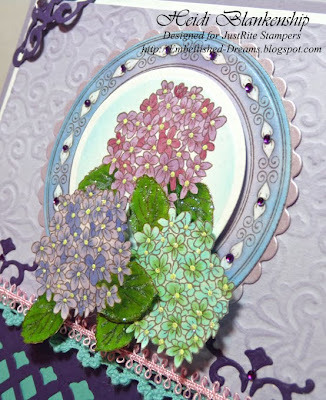 I started by stamping the image of the hydrangea three times and coloring with Copic markers. 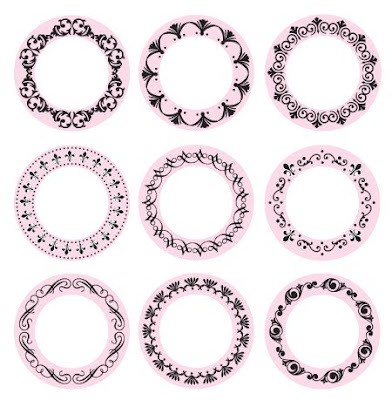 I cut out two of the images and for the third one I used Standard Circles Large S4-114 and the Wizard™ from Spellbinders™ to cut/emboss the circle diecut. I left the cardstock in the die template and stenciled through using the airbrush system from Copic. For the border I stamped the image, cut/embossed with the Wizard™ and Standard Circles Large S4-114 die templates and then airbrushed. After I had the airbrushing done I used a colorless blender pen to push out some of the color from the image. Then I cut/embossed a scalloped circle using the Wizard™ and Petite Scalloped Circles Large S4-115 die template for a mat. 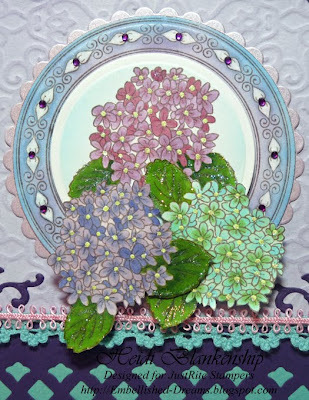 I layered the circles and the hydrangeas images and added foam tape to the back for some dimension. 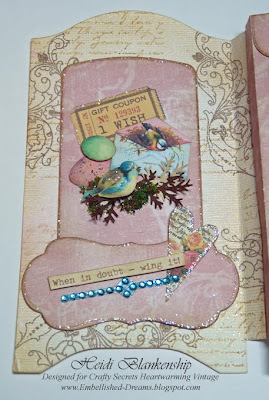 For the bottom of the card I created a border using the Wizard™ and Lattice Borderabilities® Petite S4-218 die template. Then I added some lace and trip on top of the border. 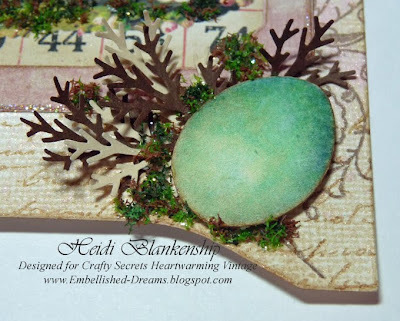 I also created an embossed background using the Floral & Stone Impressabilities™ I2-1006 from Spellbinders™ and inked the background with dusty concord ink. Then I added some accent pieces to the top corners using Lattice Pendants S4-210 die templates and I used the drop out pieces from the accents above the border at the bottom. To finish of the card I added rhinestones using Gem-Tac from Beacon Adhesives to the accent pieces, stamped border and the border at the bottom of the card. Misc.~Spellbinders™-Wizard™, Standard Circles Large S4-114, Petite Scalloped Circles Large S4-115, Lattice Borderabilities® Petite S4-218, Lattice Pendants S4-210 (accent piece), Floral & Stone Impressabilities™ I2-1006, Copic-B00, B02, BG10, BV000, BV13, V01, V04, R85, G28, YG25, YG63, Colorless Blender, Airbrush System, Sakura-Souffle (light yellow) #903, Quickie Glue Pen, Creative Impressions-Lace & Trim, Taylored Expressions-Tiny Twinkles, Joann's-Lavender Rhinestones, Beacon Adhesives-Gem-Tac, Sparkle-N-Sprinkle-Sparkling Snow Glitter. I will be leaving tomorrow for California to attend the CHA Show! I am looking forward to seeing everyone and all the excitement of the new products! 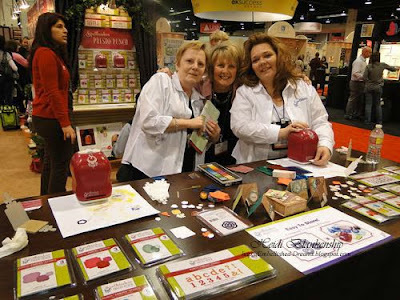 If you are going to the SuperShow I will be in the SCS booth Saturday afternoon with Spellbinders doing make-n-takes with Kim Hupke, Education Director for Spellbinders. 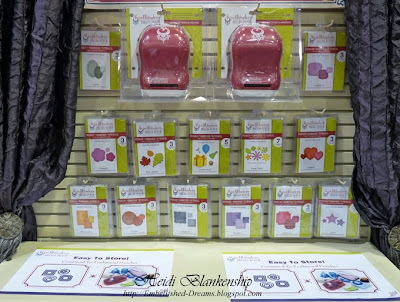 Also during the CHA Show I will be working in the Spellbinders booth (#4069). Stop by and say hello--I would love to meet you!! I am going to try and schedule a couple of posts for when I am gone but no guarantees--sorry time is running short, but I will really try! If I don't get a chance to do this it might be a few days before you hear from me, I'm not sure if I will have access to the internet. But as soon as I can I will post and I will have pictures from CHA to share with all of you! Thank you so much for stopping by today! I hope you have a wonderful day and for those of you that are traveling to CHA I hope you have safe travels! Good Morning! 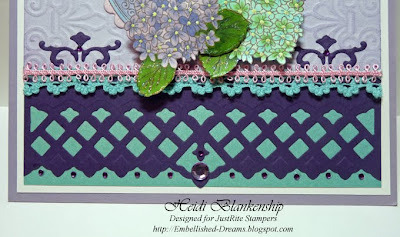 Today JustRite Stampers is having a Garden Tour Blog Hop 1 and I hope you will join in the hop and take a little time to visit JustRite Stampers Blog and each of the designers to see their beautiful creations. I have a link list at the bottom of this post to the JustRite Blog and the Design Team Members. For my card today I am using stamps from two of the NEW sets, My Garden and Seeds of Kindness. 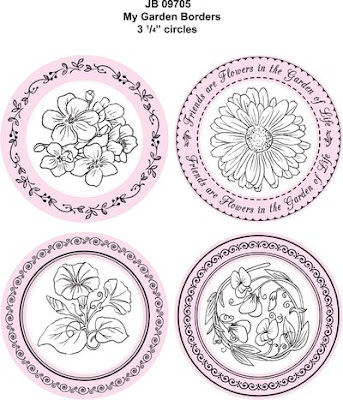 The My Garden stamp set fists the 3-1/4'' Round Stamper and comes with 4 Designer Centers and 4 Interchangeable Borders. 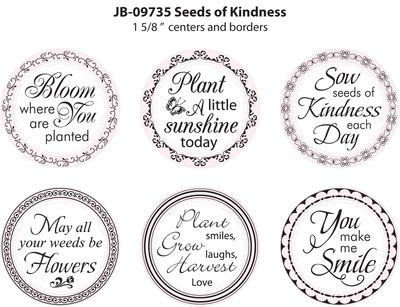 The Seeds of Kindness stamp set fits the 1-5/8'' Round Stamper and comes with 6 Centers that have sentiments and 6 Interchangeable Borders. 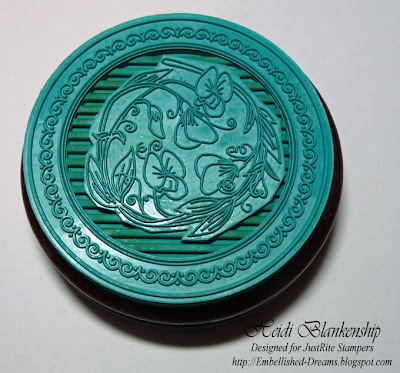 The stamp set will also fit the 2'' Round and 2'' Square Stampers. 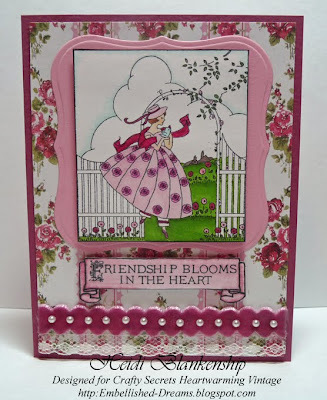 Here is the card I created using both My Garden and Seeds of Kindness stamp sets. 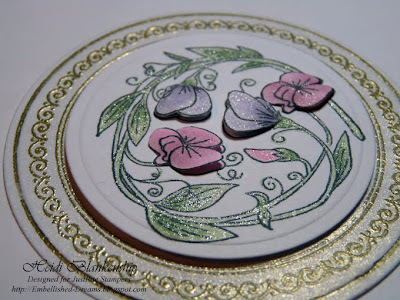 I started by stamping the image of the Sweet Pea from the My Garden stamp set using black ink. 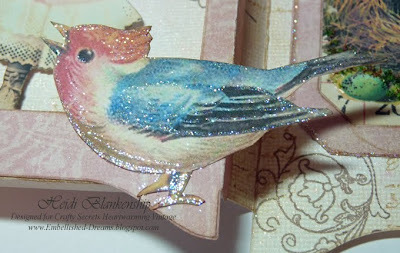 I stamped the image twice and colored with Copic markers and Spica Glitter (as shown). 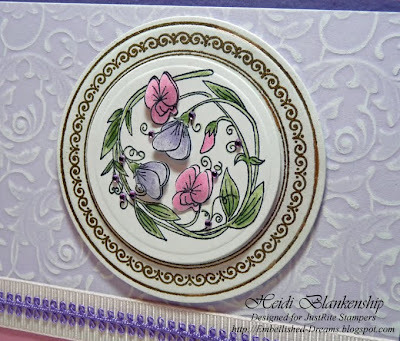 For one of the images I cut/embossed the center using the Wizard™ and Standard Circles Large S4-114 die template. I cut out the flower images on the second one and used foam tape and applied them on top of the die cut with the floral image. For the border I stamped the image using gold pigment ink, gold embossing powder and a heat tool to heat set the embossing powder. Then I sprayed Iridescent Gold Glimmer Mist and set aside to dry. 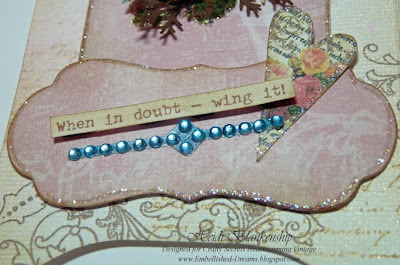 Next I used the Flourish Impressabilities™ I2-1009 along with Post-it Craft Paper to emboss the design into the paper. The Post-it Craft Paper has an adhesive backing and it also has a white core and it works perfectly for embossing and then you can lightly sand to remove the top color from the paper and have the white core show. Here is a close-up of the embossing. 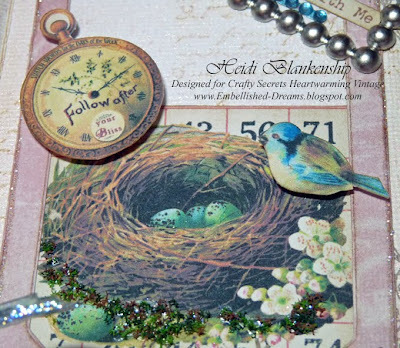 I also created a little tag down in the bottom corner using one of the sentiments from Seeds of Kindness. I stamped the sentiment using gold pigment ink and then added gold embossing powder and heat set to emboss. 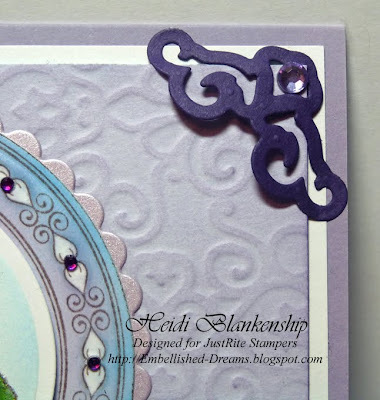 Then I cut/embossed the sentiment using the Wizard™ and Labels One S4-161 die template. After I had the die cut made I left the cardstock in the die template and airbrushed through the template using it as a stencil. 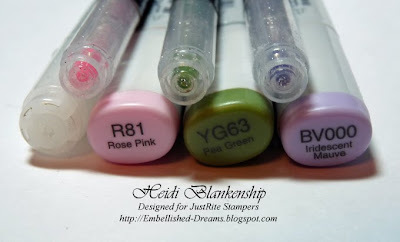 **NOTE I have received several emails asking about the stickers on my Copic airbrush. The stickers are Inanimate Stickers--have some fun with the inanimate objects in your life and give them some character. Here is a link to the stickers--->HERE. It's a wonderfully fun site! Jason and Kim were guest speakers at our church this past fall--very inspirational!! 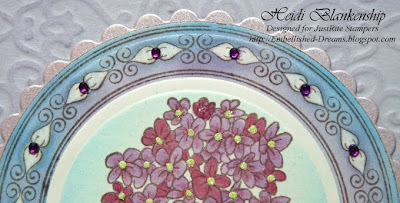 ** I also cut/embossed one of the tags from the Fancy Tags S4-235 die template set and place that in behind the label. I also added some ribbon, trim and tiny rhinestones. I also wanted to let you know that JustRite is now hosting weekly Friday Challenges! You have until Thursday Jan 21st at 10 pm Est to participate in our first Challenge. JRC_001: Get Creative With Font! Use JustRite's font to make your own custom card sentiment, scrapbook page title, background paper, monogrammed or personalized 3D gift, home decor, you name it -- JustRite wants to see how creative you can get with Font! In celebration of their first ever challenge, they are giving each of our blog readers a chance to beef up their font collection by using this coupon code: FONT25BH to receive 25% off all JustRite font sets and the Horizontal & Vertical Stamper! This Coupon Code expires at midnight January 19. Thank you so much for stopping by today! I hope you really enjoy the Garden Tour Blog Hop1 ! I think the New stamp images are so Beautiful! I would love to hear what you think about the New stamps from JustRite. I hope you have a Wonderful Day! Hello! For today's card I have used several stamps from Just For Fun Rubber Stamps, Fair Maiden H2362, Flower Sprig D3379, Bracket A3260, Eiffel Tower D2361, Great Gams B3217, Paris IX AA2353. I started by stamping the images using Tsukineko Memento Tuxedo Black ink. I also did some masking with the stamped images. Then I did a wrinkle free distress technique with the paper. 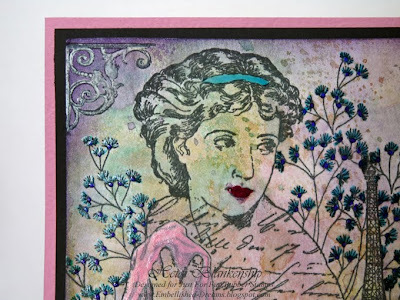 To do this I used several colors of Ranger Distress inks, Vintage Photo Distress Ink, Broken China (blue), Peeled Paint (green), Dusty Concord (purple), Worn Lipstick (pink), a craft mat, spray bottle with water and a heat tool. I press the different colors of pads onto the craft mat, mist with water and place the paper on top. Then lift up the paper and heat set. I do this several times until I achieve a look I like. Here is a close up of the background so you can see the distress look on the paper. Next I used a Pink Souffle Pen and Glaze Pens Watermelon 819, Aqua 825, Purple 824, White 800 from Sakura to go over certain areas on the images and to add a little dimension. In the picture above (on the flowers) you can see once the ink is dry there is some dimension. To finish of the card I took a chipboard tag and sprayed Sweet Pea Glimmer Mist on the entire tag, heat set to dry and then stamped the sentiment. I also inked the edges of the tag, added some tiny bits of bling and attached the chipboard tag with black sheer ribbon. Thank you so much for stopping by today! I hope you are having a wonderful weekend! Something new and exciting is happening at JustRite! 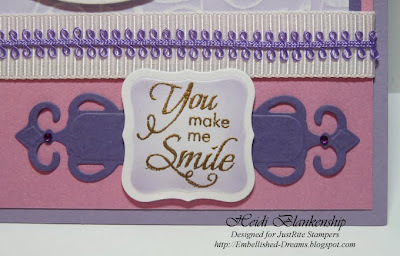 Every week JustRite Stampers will be hosting a JustRite Friday Challenge, the first one started this past Friday, January 15th, 2010. But there is still time to make your project for the challenge! This week the challenge is Get Creative with Font--so get out your font sets and get busy! 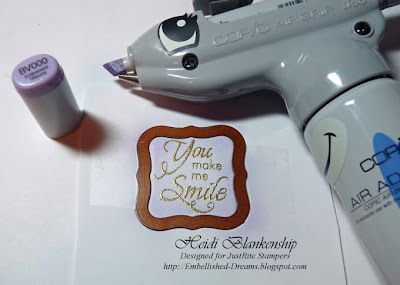 You will need to upload your weekly project to an online blog, gallery or photo hosting website and then link to your project back to the JustRite Stampers Blog on the blog post, using the Mr. Linky box that will be provided each week on the challenge post. You will have until the following Thursday to make and enter your project. Then the winner will be chosen and announced on the JustRite blog's main page on Friday morning (one week after the challenge was issued), along with the next challenge being issued. To find out all of the details and see a full list of the challenges click HERE. Oh, one more thing--there will be some Fantastic prizes!! I hope you will join in the fun!! Good Luck! I can't wait to see your creations!! I will be back in just a little bit with some creative inspiration. Good morning! 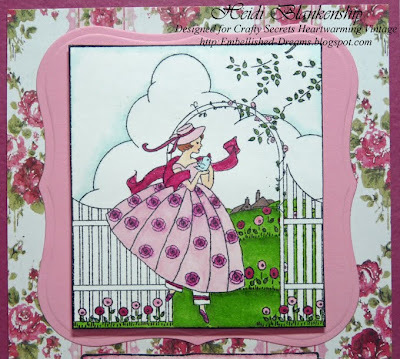 Today is another Sneak Peek and Reveal Day for Crafty Secrets Heartwarming Vintage. 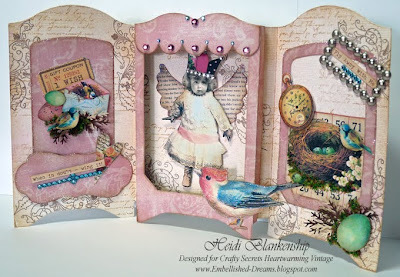 Today the Crafty Secrets Design Team will be doing a preview of the NEW Altered Fairies Creative Scraps and NEW 3D Shadow Box Cards. Vicki Chrisman, our Design Team Leader came up with an idea to create two 3D Shadow Box die templates, and our design team is using the 3D Shadow Box die cuts today with our projects. For more information on these products and other Crafty Secrets products click HERE to please visit the Crafty Secrets Blog. I also have a link list at the bottom of this post to the other design team members so you can visit each of their blogs. So are you ready for the Sneak Peek?? 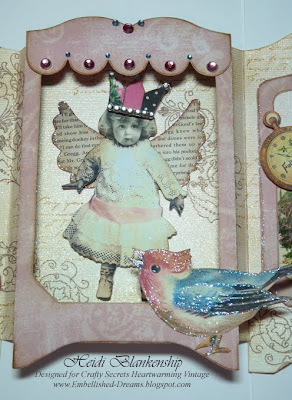 Let me just start off by saying you are going to LOVE the vintage images in the New Altered Fairies Creative Scraps!! Gorgeous images! I had a lot of fun working with them and the 3D Shadow Box Cards. There are so many possibilities! 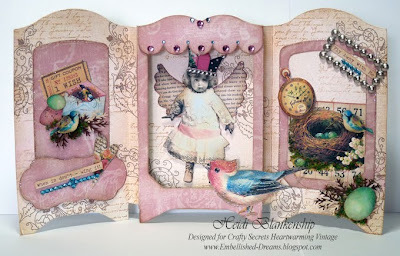 Crafty Secrets will also be selling kits with the 3D Shadow Box Cards that you can purchase with or without the Altered Fairies Creative Scraps. Here is a link list so please be sure to visit the Crafty Secrets Blog and Website and Design Team Members! I know they have all been busy creating some wonderful artsy inspiration to share with all of you! Thanks so much for stopping by today! I would love to hear what you think of the NEW Crafty Secrets products! I hope you have a Wonderful Day! 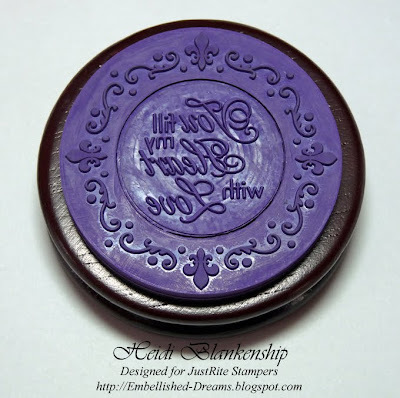 Just For Fun Rubber Stamps Announcement!!! 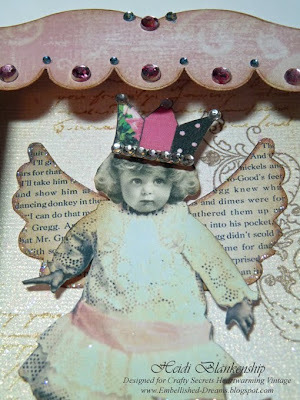 Tattered Angels January 2010 Guest Designer!! !